In your search for a rehab facility, we believe you should expect high quality care as well as great service. Our goal has been to assemble a care team committed to providing exceptional client service and care for your furry friend. Our commitment to you is to continue to offer our world class service and a state-of-the-art facility. 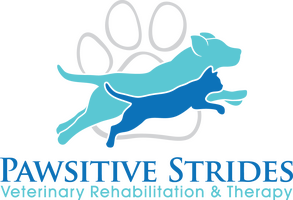 Your pet's treatment at Pawsitive Strides will be tailor-made exclusively for them. We work with your veterinarian to create a plan designed to encourage your dog or cat's individual growth and development. Our veterinarians and specialized technicians consider pet-parents an integral part of the care we provide, and will also include you in the treatment process (you may even have homework to further advance your pet's comprehensive care)! Together we can provide the care and compassion your pet deserves! At your pet's initial visit and assessment, our team will work with you to determine which of the therapies we offer will be the best fit for you and your pet. You may decide you want a combination of different modalities (such as combining chiropractic care and acupuncture sessions) or focus on a single area of treatment (like the underwater treadmill). The number and frequency of treatments is often a factor of the patient's progress, and may change as your pet responds. As an added benefit, many treatment packages can be purchased which may lower the cost of services per visit! 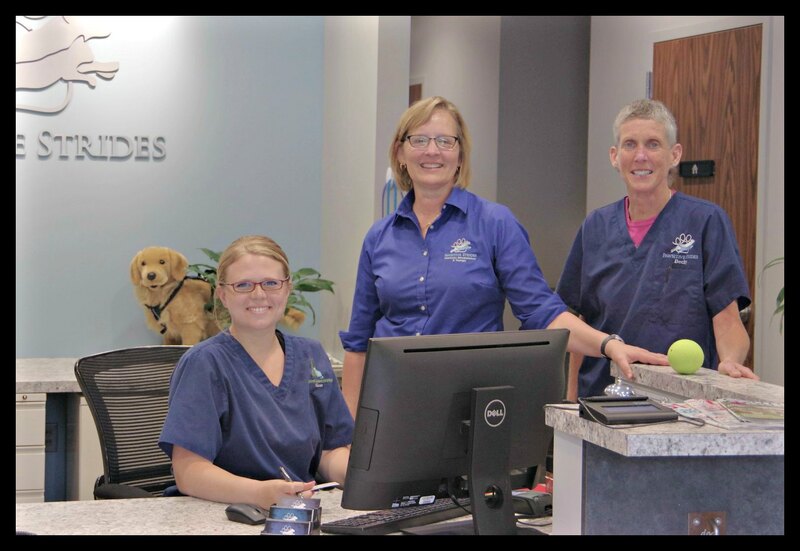 Our goal at Pawsitive Strides Veterinary Rehabilitation and Therapy of Des Moines is to relieve pain, promote fitness, and improve recovery to restore our pets to maximal function, improving their quality of life. To schedule an initial consultation exam call us at (515) 575-9655. Our staff will help you with any questions or concerns you might have. Knowledge of your pet’s medical history, including recent laboratory work. Your primary care veterinarian can fax any pertinent records to us at (515) 575-9655 or email to info@pawsitivestridesdsm.com. List of your pet’s current medications and allergies. Please bring your pet’s medication with you. If your pet has had any x-rays taken recently, please bring those with you as well. Once you have scheduled a visit with us we can request records and digital x-rays on your behalf from your primary care veterinarian. If you do not have current x-rays and it is found during your initial exam x-rays are needed this can be done by your primary care veterinarian or with Pawsitive Strides through Ingersoll Animal Hospital. We offer a lot of treats during therapy so if your pet has food allergies or dietary restrictions we encourage you to bring the appropriate treats and food so we can reward their hard work during therapy. You may download our Admission Form and Patient Questionnaire to fill out before your Initial Consultation Examination appointment or plan to come in 10 minutes early to fill them out. We start with scheduling an Initial Consultation Exam with our Certified Rehabilitation Veterinarians. The initial consultation exam is the important first step in developing a therapy plan tailored specifically for your individual dog’s problems and needs. During this 90-120 minute-long initial exam, the rehab veterinarian will conduct an overall assessment of your pet’s condition, strength, and function. They will assess pain level, joint mobility, muscle strength and tone, nervous system function, posture, weight and dietary needs, as well as home environment, lifestyle routines, and goals. An individualized treatment plan will be devised specific for your pet's needs. After our rehab veterinarian has assessed or diagnosed your pet’s condition, she will work with you to customize a treatment plan that works with your pet’s needs, your schedule, and your budget. We have a wide range of therapeutic modalities: therapeutic exercises including hydrotherapy or underwater treadmill, laser, manual therapies, acupuncture, chiropractic, electrical stimulation, massage and more. From the moment your pet’s paws first step into our office for their first visit, our trained staff begin evaluating their gait, flexibility, and ease of motion. Your pet’s health, personality, and your family’s lifestyle are all important factors and impact the direction of your pet’s recovery plan. Progress is monitored closely and continuously adopted to how your pet is responding. Throughout your pet’s treatment, regular check-ups with our certified rehabilitation veterinarian will evaluate your pet’s progress and allow for adjustments to the treatment plan based on the needs of each unique patient. As your pet progresses and moves towards their release from therapy, our aim is to prepare you to continue your progress at home. Completing your sessions doesn’t mean the end of your work; a healthy lifestyle is the key to long-term health. Incorporating a home exercise program will help your pet maintain the strength and mobility they’ve worked so hard to achieve. 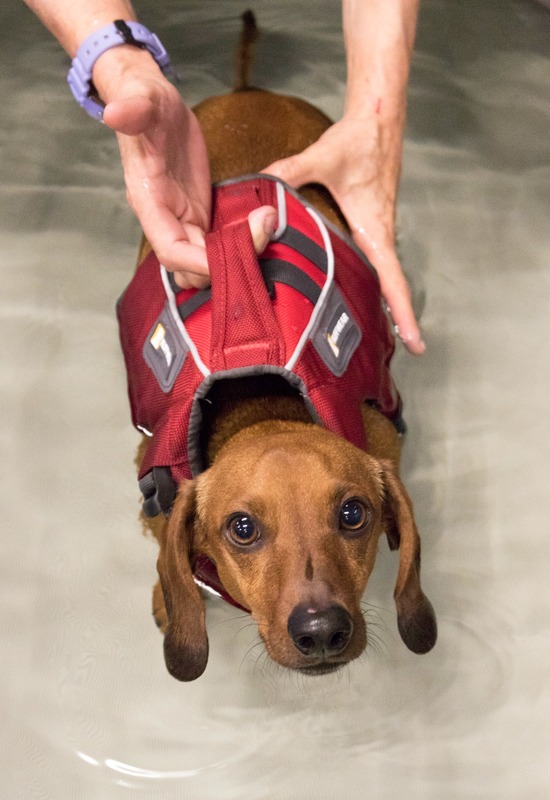 Some pets move on to our ongoing fitness program to help maintain their strength and mobility they have gained while others do well with their home exercise program. Release from therapy doesn’t mean goodbye-we will always be here as part of your pet’s health care team.